Self binding a quilt was the method often used by women in the 18th and 19th centuries. It is where the backing fabric also doubled as the quilt’s binding. This method allowed the quilter to show off their backing fabric on the front and it was also less time-consuming than using the continuous binding method. The drawbacks however need to be considered. History has shown us that it is these types of bindings that wear out first. So using any binding method that only uses a single layer of fabric will not wear well. * Cut backing fabric 4" wider on all sides. It's better to have the backing too large than too small, so give yourself room for error. * Quilt layers together either by hand or machine. Start in the center and work your way out so that if the fabric shifts or stretches, the excess will move to the edges of the quilt. * Fold the excess backing fabric under the quilt and use a rotary cutter & ruler to square up the quilt top and to trim away any excess batting. * Decide the width you want your binding to be and double it. Trim excess binding. If you are wanting a 1" binding width then trim the excess binding to 2". 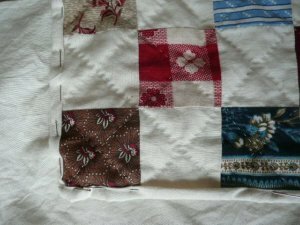 * Fold excess backing in half so that the raw edges of the backing meet the raw edges of the quilt. * Fold the backing fabric up and over the raw edges of the quilt. * Pin in place taking care at the corners. You can miter your corners if you choose. * If you want a full binding (batting in your binding) then remember to include this in your measuring and not to trim it away. * There is no right or wrong width to this binding. Choose what looks best for your quilt.